Costa Rica: a third world country makes a first-class decision! Costa Rica is the first Latin American country to ban hunting! In 2012, Costa Rica was the first Latin American country to ban hunting by a unanimous decision of the National Congress. It was a step forward on the path to the protection of wildlife – probably the most valuable asset of this country. Before the ban, hunters from all over the world flocked to Costa Rica to hunt pumas or jaguars, or to catch these wild animals and then sell them on the black market. The country’s population launched an initiative to protect wildlife. The petition with over 177,000 signatures was then submitted to Congress. The big cats were not the only victims of the insatiable greed of the hunters. Trappers caught parrots and sea turtles and smuggled them out of the country. People demanded $ 5,000 (around € 4,750) per person for hunting trips – and the population was fed up with it. More than 4.5 million people live in the country and it is said that Costa Rica is one of the most biodiverse nations in the world. Support for the congress also came with the decision to close the zoos in the country and return the animals to their natural habitats. Those who violate the new hunting law will be punished with up to four months imprisonment and pay a fee of $ 3,000 (around € 2,850). My comment: Costa Rica is also one of the countries that have no military. And we, who are not third world countries, we, who believe that we are the strongest and the best, we, the first world countries, we are not even able to banish the wild animals from the circus, to ban the hobby hunt, let alone close the animal’s open air prisons, the zoos. Thousands of farm animals die in barn fires, and no one seems to care. When a barn catches fire, it can have disastrous consequences for the livestock trapped inside. “The animals have no chance to escape. I mean, how do you evacuate 5,000 pigs or 60,000 chickens?” said Vicki Fecteau, the director of the Canadian Coalition for Farm Animals. She said the immense scale of modern farming and the giant barns required mean the casualties are often enormous. Fecteau spoke to Michael Enright, host of The Sunday Edition, about the coalition’s efforts to raise awareness about the toll barn fires take on the lives of animals. Between January 2015 and October 2018, 610,000 farm animals died in barn fires in Canada. Fecteau said society has a blind spot when it comes to the wellbeing of livestock. For example, she said, there was international media coverage when 43 racehorses died in an Ontario barn fire in 2016. Fecteau said people are very responsive when companion animals — including horses — are hurt or killed, but not livestock. The problem is not just the size of modern barns, but their susceptibility to fires. Ontario’s Agriculture Ministry reports that 40 per cent of barn fires in that province are related to electrical problems. Fecteau said the environment in barns is very harsh on electrical systems, causing the equipment to deteriorate and malfunction. 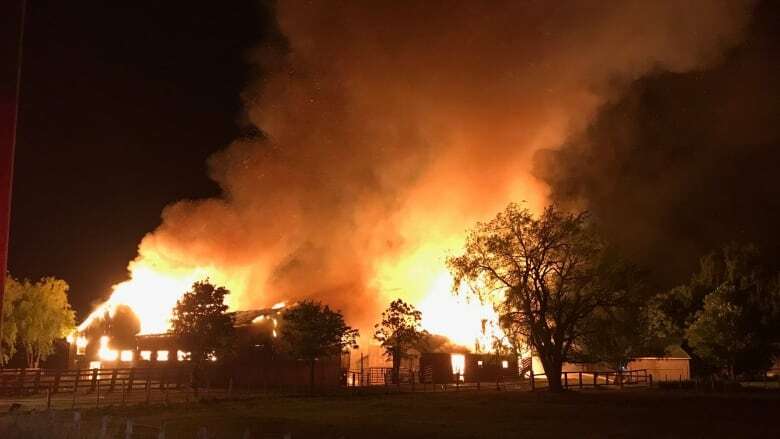 The coalition is now working with the government to try and increase the use of fire detection systems in barns in Canada. Fecteau said installing fire systems is expensive for farmers, but they also lead to lower insurance premiums.